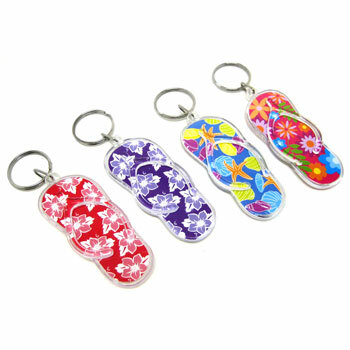 Keychain with assorted color flip flop designs. 3 inches by 1 1/4 inches. Plastic. Sold by the dozen. $2.70 per dozen for 60 dozen or more. $2.35 per dozen for 90 dozen or more.